This phenomenon of nature is mentioned but rarely in the Old Testament. The beauty of the rainbow is dwelt upon (Ecclus. [Sirach] xliii. 11 et seq., 1. 7), and the glory surrounding Yhwh is compared to the splendor of the rainbow (Ezek. i. 28; comp. Rev. iv. 3, x. 1). A poetic interpretation, based on ancient mythological ideas, has been given to the rainbow in connection with the story of the Flood. When the waters subsided, God placed the rainbow in heaven in token of the covenant He had made with Noah (Gen. ix. 12 et seq.). The rainbow is Yhwh's immense bow of war ("my bow"). This idea may be compared with the conception of the flashes of lightning as Yhwh's arrows (Ps. vii. 13 et seq. ; Hab. iii. 11). If Yhwh lays aside His bow and hangs it in the clouds, it is a sign that His anger has subsided; on beholding it men may feel assured that the storm is past and that no flood will come. These mythological conceptions are of course very ancient. They are found in India, where the bow is Indra's weapon, which he lays aside after his battle with the demons. The Arabs also regard the rainbow as Ḳuzaḥ's bow, which he hangs in the clouds when he has finished shooting. The legend of the rainbow is not found in any of the fragments of the Gilgamesh epic. The Talmud classes the rainbow with other things created at twilight on the last day of Creation (Pes. 54a), as the Rabbis were disinclined to believe that the laws of nature were changed after Creation. Naḥmanides, in his commentary on the Pentateuch, says: "We are forced to accept the view of the Greek scientists that the rainbow is the natural result of the sun's reflection on the clouds." The literal translation of "Ḳashti natatti be-'anan" (My bow have I set in the cloud) indicates that the rainbow was already an established institution; but it thereupon assumed a new rôle as a "token" of God's covenant with the earth against the Flood. The token shows that Heaven's wrath ceased, the ends of the bow pointing downward, as the warrior lowers his bow on declaring peace (ib.). The rainbow is a sign of censure and a reminder that the wickedness of mankind is deserving of punishment. The virtue of the righteous is supposed to protect his generation from evil, and the appearance of the rainbow is a reproach to the community, as it shows that there were none worthy of such protection (Ket. 77b). The rainbow is the revelation of God's glory on earth, and to show due respect one must not gaze at the rainbow, just as etiquette forbids one to gaze at a high official (Ḥag. 16a). 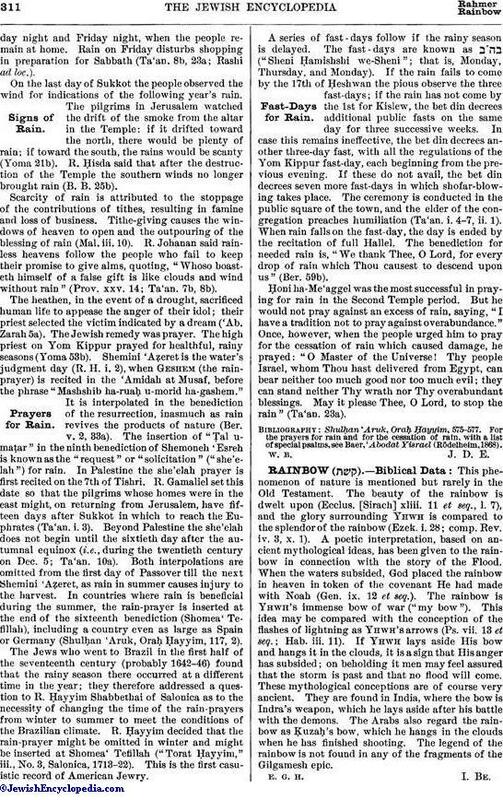 R. Joshua b. Levi thought that on seeing the rainbow one should fall on his face in reverence, as did Ezekiel when he saw "the appearance of the bow that is in the cloud" (Ezek. i. 28). 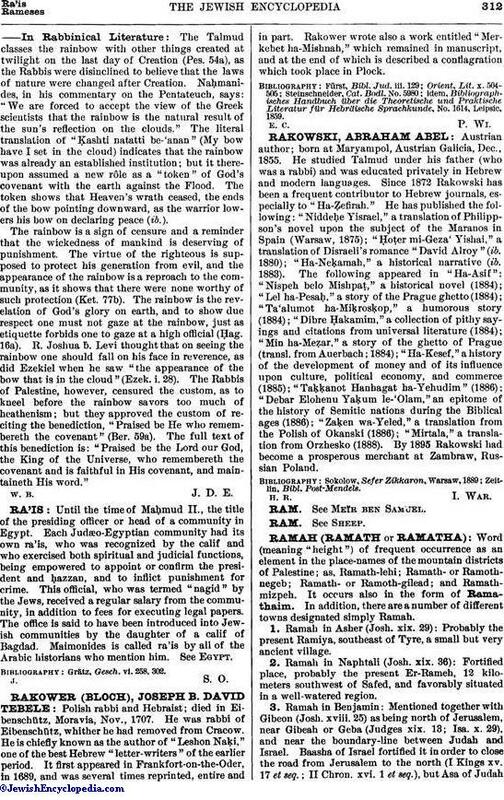 The Rabbis of Palestine, however, censured the custom, as to kneel before the rainbow savors too much of heathenism; but they approved the custom of reciting the benediction, "Praised be He who remembereth the covenant" (Ber. 59a). The full text of this benediction is: "Praised be the Lord our God, the King of the Universe, who remembereth the covenant and is faithful in His covenant, and maintaineth His word."